Tasha Batts, DDS, gently leaned forward on the edge of a living-room sofa, the mini lamp on her goggles illuminating 4-year-old Legend Carey's wide-open mouth as he lay across a metal folding chair. "Any of these teeth loosey-goosey yet?" asked Batts, a pediatric dental resident at the Case Western Reserve School of Dental Medicine. With her fingers still expertly touring his mouth, Legend couldn't answer coherently. His dad, Greg Carey, filled the gap: "Not yet, but we think they'll be coming out soon." This is home dentistry, Case Western Reserve style. The program, which began in 2015, is an extension of one launched a decade earlier by three partners: the dental school's Department of Pediatric Dentistry, University Hospitals Rainbow Babies & Children's Hospital and The Centers for Families and Children, a human-services agency in Cleveland. 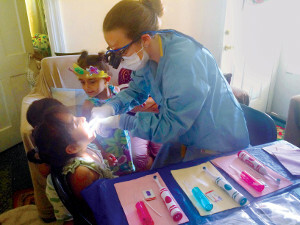 Under that older program, pediatric dental residents and professionals travel to Head Start and other school-readiness programs the centers run across the region to provide checkups, cleaning and other oral care. Now, they also visit the homes of families across a three-county area where children can't enroll in traditional Head Start programs because of certain disabilities or language barriers. They've visited more than 500 families and provide care to parents as well when needed. The house calls are the next logical way to reach underserved people. And they t the mission of the school's pediatric dental department to take the lead in the local fight against childhood cavities, which represent "the No. 1 chronic infectious disease in children in America," said Gerald Ferretti, DDS, chair of the department and head of pediatric dentistry at UH Rainbow. He said cavity-causing bacteria can travel from person to person or tooth to tooth. The outreach program made a di erence for Legend, who happily picked out stickers and a toothbrush from a goody bag after his checkup. Now he "wants to brush his teeth four or five times a day," his father said.